Cancer is often painful, but some types, such as melanomas and glioblastomas, are notably pain-free. Now, Ru-Rong Ji, Duke University, Durham, US, and colleagues might have found one reason why. The researchers show that in melanoma-bearing mice, programmed cell death ligand-1 (PD-L1), a protein tumor cells produce to suppress immunity, binds to its receptor, PD-1, on sensory neurons. That renders the neurons less excitable, ultimately masking the pain that would otherwise arise. 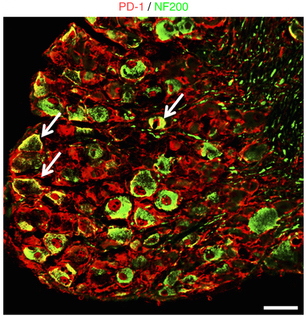 Ji and colleagues also found PD-L1 in the skin, dorsal root ganglia (DRG), and other tissues in healthy mice, and that interfering with PD-L1/PD-1 signaling in the periphery triggered mechanical allodynia in the animals. The findings were published in the July 2017 issue of Nature Neuroscience, along with an accompanying News and Views by Michael Hirth, Jagadeesh Gandla and Rohini Kuner, Heidelberg University, Germany. According to Ji, the idea that cancer can suppress pain has yet to take off. “The majority of researchers think that cancer can only cause pain—that cancer can only produce proalgesic substances,” he said. These substances act on nerve fibers to heighten their excitability (see RELIEF related feature article). For example, in 2004, researchers showed that T cells from mice genetically modified to lack PD-L1 produced more proinflammatory cytokines (Latchman et al., 2004). Ji knew that activation of the immune system is usually associated with pain, so he asked, Could PD-L1 control pain as well? To find out, lead authors Gang Chen and Yong Ho Kim, along with their colleagues, began with the formalin model of acute inflammatory pain. They injected formalin into the paws of naïve male mice, followed by a vehicle solution or PD-L1 at one of three concentrations. As the researchers had predicted, PD-L1 dose-dependently reduced how long the animals engaged in spontaneous flinching and licking of the inflamed paw, two pain-related behaviors, suggesting the protein relieved pain. Next, the researchers injected PD-L1 or a control antibody, human immunoglobulin G (IgG), into the paws of naïve mice. PD-L1 decreased mechanical sensitivity, an effect that began within 30 minutes of the injection and lasted for three hours. In contrast, blocking the actions of PD-L1 with soluble PD-1 or with an anti-PD-1 mouse antibody (RMP1-14) resulted in allodynia lasting for the same duration, compared to IgG injection. And administering nivolumab, a US Food and Drug Administration (FDA)-approved humanized antibody selective for PD-1 that has been successful in fighting several types of cancer, had an even longer effect on allodynia (an increase was observed at five hours). Finally, less allodynia was seen when PD-L1 was injected intrathecally in a mouse model of neuropathic pain (chronic constriction injury) or a rat model of bone cancer pain. Such tissues are surprisingly diverse. The researchers could detect PD-L1 protein at varying levels in the skin, sciatic nerve, DRG, spinal cord, brain, liver, spleen, and kidney. They also found PD-1 (both messenger RNA and protein) in mouse DRG neurons. And this receptor appeared functional. For example, when PD-L1 was washed onto DRG neurons from either mice or humans, it hyperpolarized the cells, making them less likely to fire. As for how it did so, the researchers showed that exogenous PD-L1 inhibited sodium channels and boosted potassium channels, in each case through activation of Src homology region 2 domain-containing phosphatase 1 (SHP-1), a tyrosine phosphatase. At the same time as Ji and colleagues considered the relationship between PD-L1 and pain, they grew curious about the melanoma-bearing mice the lab was studying. Unlike other common cancer models, such as the bone cancer model, these mice showed neither spontaneous pain-related behavior nor mechanical allodynia (Pacharinsak and Beitz, 2008). But they did have high serum levels of PD-L1, and the researchers confirmed that cultured melanoma cells could secrete the protein. What’s more, levels of PD-L1 in the tumor cells far exceeded those in other examined tissues. To test whether PD-L1 was responsible for the apparent lack of pain in these animals, the investigators blocked PD-L1 signaling. By delivering the soluble receptor for PD-L1, RMP1-14, or nivolumab directly to the tumor site, they were able to trigger flinching and licking, and induce mechanical allodynia. It’s unlikely that these manipulations simply raised the animals’ baseline pain sensitivity, since only flinching and licking were seen when PD-L1/PD-1 were targeted in healthy mice. Instead, “this indicates that there is cancer pain with melanoma, but it’s masked by PD-L1,” said Ji. The masking effect of PD-L1 seemed to result from activity of the PD-1 receptor on sensory neurons rather than on immune cells. Indeed, knocking down PD-1 expression in DRG neurons spurred the same pain-related behaviors (allodynia and spontaneous pain) in melanoma-bearing mice, while levels of key immune and inflammatory markers remained unchanged after treating the mice with the soluble PD-L1 receptor. Still, PD-L1 is probably not working alone. Schmidt and colleagues have repeatedly shown that carcinoma cells make opioids, which decrease but do not completely counteract pain (e.g., Quang and Schmidt, 2010). “Cancer pain is a balance, and on one side of the balance you have the pain-producing mediators, and on the other side you have the pain-relieving mediators,” Schmidt said. The exact balance would hypothetically depend on the type of cancer, and whether the cancer was painful or painless. It might even change with the stage of cancer. “Maybe at an early stage, cancer can produce a lot of PD-L1. But after it has metastasized, maybe to bone tissue, these cancer cells would be different, and they would produce less PD-L1 or additional pro-nociceptive substances,” said Ji. At the moment, it’s unclear what the findings mean for cancer patients treated with immunotherapies that neutralize PD-L1 or PD-1. Schmidt has not heard patients for whom he’s prescribed these drugs complain that they cause pain. And yet, “Ji’s group shows that if you block PD-1 with nivolumab, you should get pain.” Or, if patients already have cancer pain, the drugs should make it worse. “It will be interesting to see if that holds up or not,” Schmidt said. While there have been scattered reports of pain in those taking nivolumab (Beaver et al., 2017; Kudo et al., 2017), “there’s no careful research on this topic,” said Ji. He is now collaborating with physicians to address this issue. Nat Neurosci. 2017 Jul; 20(7):917-926. Nat Neurosci. 2017 Jun 27; 20(7):897-899. PD-L1-deficient mice show that PD-L1 on T cells, antigen-presenting cells, and host tissues negatively regulates T cells. Animal models of cancer pain. FDA Approval of Nivolumab for the First-Line Treatment of Patients with BRAF(V600) Wild-Type Unresectable or Metastatic Melanoma. Nivolumab treatment for oesophageal squamous-cell carcinoma: an open-label, multicentre, phase 2 trial.